Well we dropped our guests off at the train station around noon today. We had a great visit. They brought great weather with them. Now that they are gone it is pouring rain. As you know we had toured Assisi a couple of days before where we learned about St. Francis who was said to be able to talk to animals and once preached a sermon to the birds. Anyway, Kaye was taken particularly with a story about St. Francis and a wolf. Seems a wolf was eating the people and animals in a town. The desperate citizens asked St. Francis to help. St. Francis went into the woods where the ferocious wolf lived and convinced him that God wanted him to stop hurting the people of the town. The wolf bowed his head and placed his paw in St. Francis’ hand and they went together into the town. The townspeople were astounded and agreed to feed the wolf from then on so he wouldn’t be hungry. He lived two years that way and was buried in the churchyard. We decided to visit Gubbio yesterday. I did learn a couple of lessons with our first guests, do some research! So I downloaded info on Gubbio. A happy coincidence! Turns out Gubbio is the town where the wolf incident occurred! Kaye said she thought the wolf and St. Francis were her favorite things from her trip. 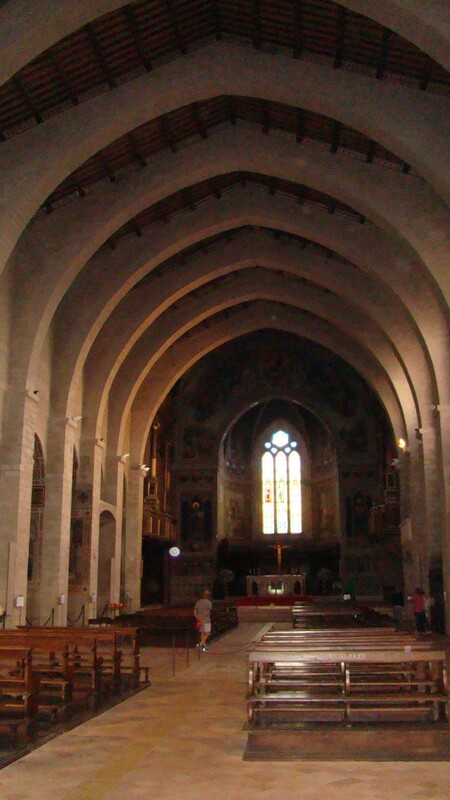 Here is a link to the Wolf of Gubbio Legend. 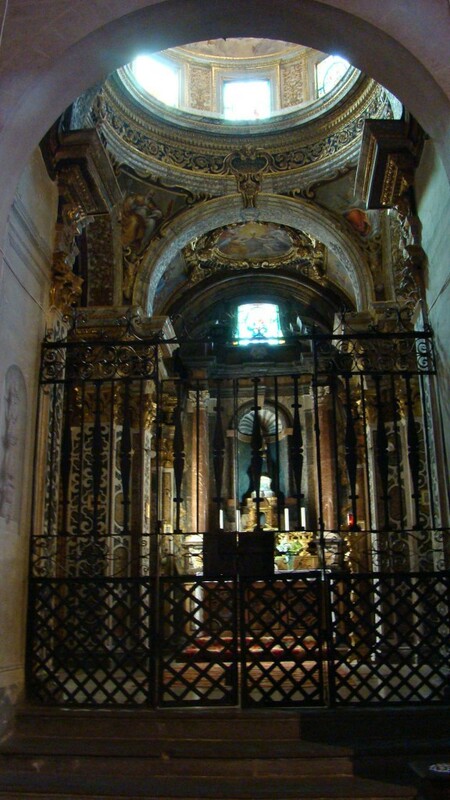 We tried to visit the Chiesa di Pace where a wolf skeleton was found in the 1800s corroborating the legend. It was closed. Too bad. We toured the upper town, took in the view and visited another church. 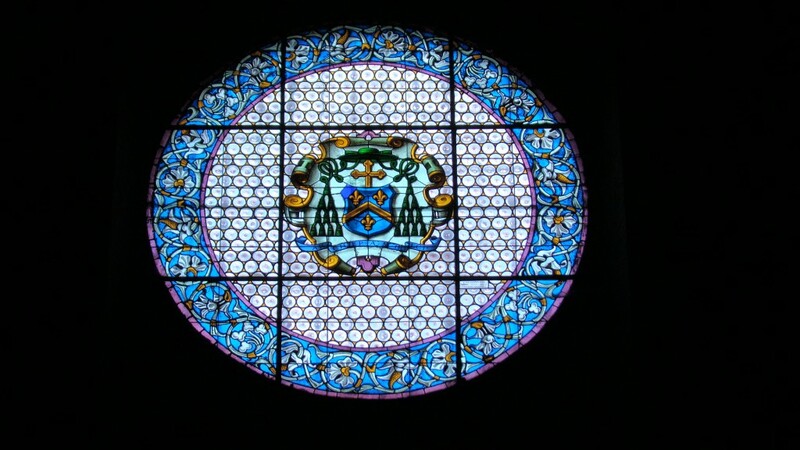 Here are pictures in the church. 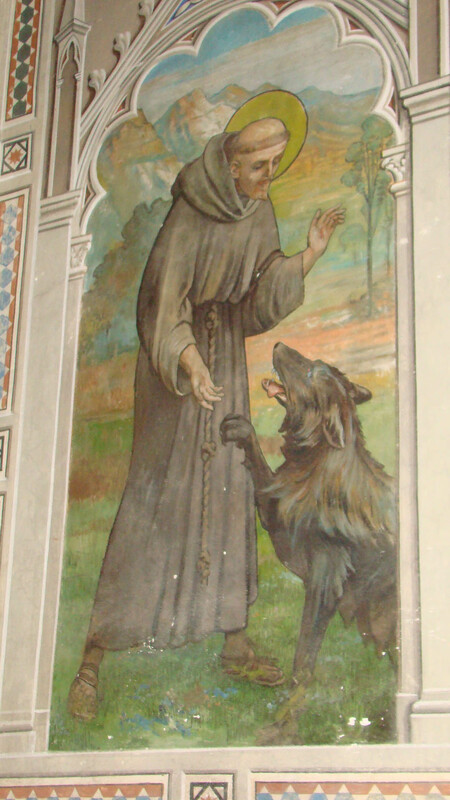 One is a fresco of St. Francis and the wolf. Another coincidence – we had made reservations at Taverna da Lupa (Tavern of the Wolf) so we were all excited that our theme was ongoing. It was a nice place. Not as good as our previous restaurants though. We sat outside. It also turned out to be a Buon Ricordo member. 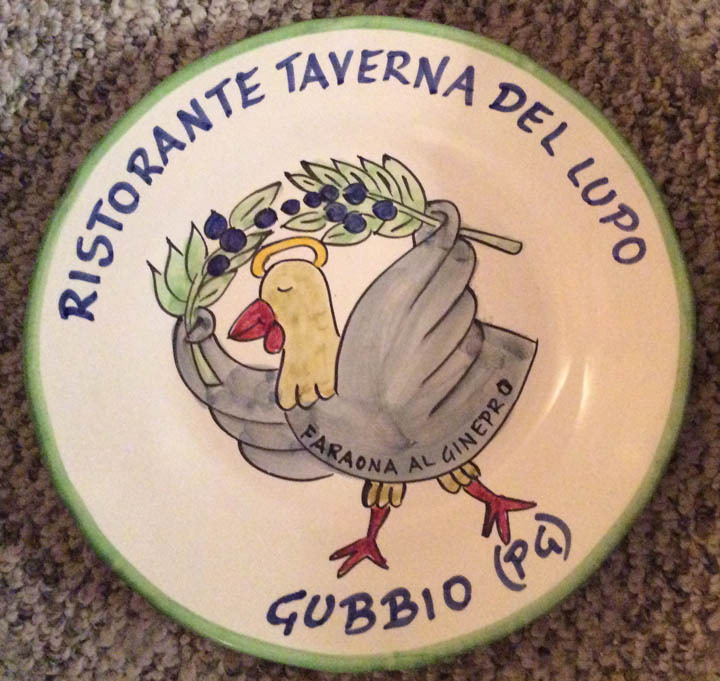 This is a group of restaurants that each have a specialty dish and if you order it you get a ceramic plate (I have probably 6 of them from many vacations – indeed a Buon Ricordo (good memory)). 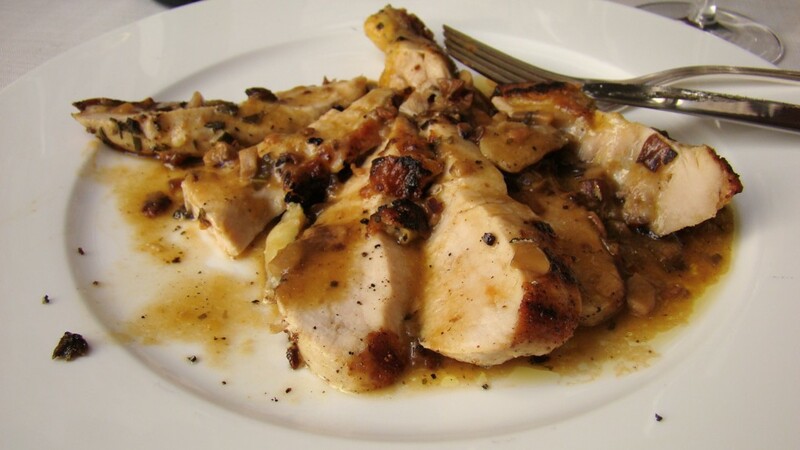 Kaye and I ordered Faraona al ginepro – roasted Guinea Fowl with Juniper – and got our plates. The dish was very good. All in all a nice day. Last night we went outside so Luther could smoke a cigar. HORRORS! Bar Mary was closed! What was this! Even Cafe Centrale was closed. This morning we found out it is now considered the winter season so they close early on Tuesday. We went back up and got wine and glasses and sat outside. Susan and Gary and Mr. Luca dropped by to meet our guests. We met with Manuele last evening after our sight seeing. It was good to see much progress. The air conditioning units are installed in the living room and the bedroom. We discussed covering the pipes on the patio. Manuele wants to uncover the old ceiling in the hallway where they installed the new stairway. It is now covered with wallboard but under that is the old vaulted ceiling. Of course we agreed with that! He also discussed with us the fireplace. He wants to change it so it doesn’t look like a Tuscan fireplace (who knew!). It has brickwork and he says they only use stone in Umbria. So I was fine with that as well. I believe he is not charging extra for this as he said “I will do this for you”. Also that Zona di Notte thing was again brought up. Manuele made a pretty good case for it and I think we will have him move a glass door which is at the head of the steps into the hallway. He will tint it which will make the master bedroom and bath more private. He said we could probably start moving in in a couple of weeks! whoo hoo! 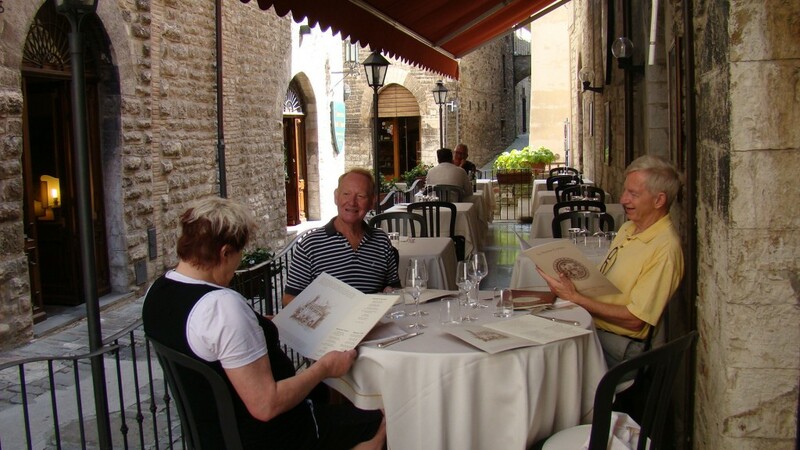 This entry was posted in Eating, everyday life in Umbria, Guests, House renovation, restaurants, Umbria, Uncategorized, Visitors on October 1, 2014 by Nancy Hampton.